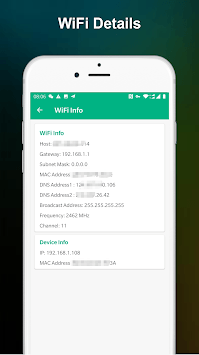 WiFi Signal Strength Meter - Network Monitor & WiFi Monitor can view your current WiFi signal strength and detect WiFi Signal Strength around you in real time. WiFi Signal Strength Meter - Network Monitor & WiFi Monitor can help you Find the sweet spots in your WiFi network. WiFi Signal Strength Meter - Network Monitor & WiFi Monitor is a simple tool that allows you to view your current WiFi signal strength. 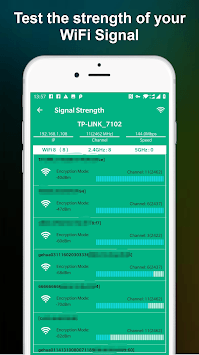 WiFi Signal Strength Meter - Network Monitor & WiFi Monitor is useful in finding good areas of WiFi connectivity in your WiFi network. WiFi Signal Strength Meter - Network Monitor & WiFi Monitor can quickly check your WiFi strength to find the best location. 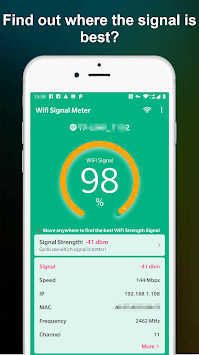 WiFi Signal Strength Meter - Network Monitor & WiFi Monitor is constantly updating the signal strength so you can walk around your house, work, or anywhere to find the best WiFi signal. WiFi Signal strength below 50% can cause disconnection issues. Its better to have WiFi signal strength above 60%.